Travelling to Australia is at the top of the agenda for many inquisitive international tourists. However, more often than not it’s Sydney, Melbourne and the Gold Coast that are the preferred destinations of choice for people alike. Perth however, is one place that is less visited, yet has a level of appeal that is often overlooked or forgotten. Perth is the capital of the Australian state of Western Australia and is also the fourth most populated city in Australia. Perth is the capital of the Australian state of Western Australia and is also the fourth most populated city in Australia. But it’s not the size of Perth that enables this city to compete with the big boys of Australia, instead of the variety of things to do and see within walking and cycling distance. Perth and its surrounds have all the essential makings for the ultimate holiday with friends and loved ones or just yourself. 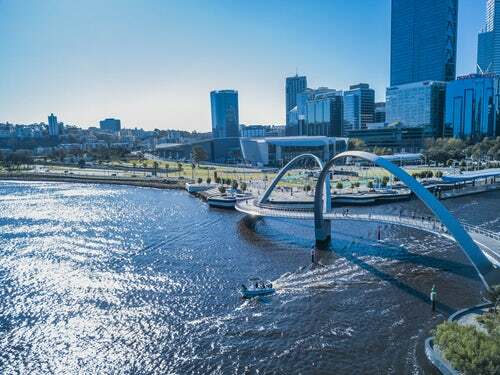 Whether it is a weekend break in a bed and breakfast in Perth or several leisurely weeks in a campervan, you’ll find that this great city has everything you would ever hope for or expect from a holiday destination. Perth is often compared to California, is that it is continuously blessed with beautiful weather. It has more annual sunshine hours than any other Australian capital city. December to February bring hot, long summers, with mild cool winters from June to August. Like any city or town you are travelling to and have very little knowledge about, it pays to plan part or most of your days in Perth, or at least familiarise yourself with what the city has in store as far as entertainment goes. If you are short on ideas or have done little research, I have an ideal itinerary for your first full day there. After a good nights sleep in your bed and breakfast in Perth, the first thing I recommend you do is to take a trip to Kings Park and gaze at the spectacular views of the city and the rivers. From here you could head to the Botanic Gardens, venture above the many trees on the Federation Walkway and then perhaps enjoy a beverage and a bite to eat at an eatery on Saint Georges Terrace, Adelaide Terrace or King Street. After a brief stop, you should head to some of Perth city’s top attractions, such as the Swan Bells Belltower and maybe the highly popular art gallery. Once you’ve revitalized with some lunch, you could venture to the local museum and then Perth Zoo for the afternoon. There’s a fair bit of walking to do, but that’s what holidays are all about. There aren’t too many cities in the world that offer as much as Perth with such a small radius. Once you’ve revitalized with some lunch, you could venture to the local museum and then Perth Zoo for the afternoon. There’s an itinerary for your first day. All you need to do now is sit down at one of Perth’s fine restaurants and then wander back to your bed and breakfast in Perth. You should have no problems organising the rest of your holiday because there’s no shortage of things to do and see. All you need to do now is sit down at one of Perth’s fine restaurants and then wander back to your bed and breakfast in Perth.